From the Baixa we have an easy approach to the Chiado thanks to the elevator of Santa Justa that will take us to the top of Chiado. 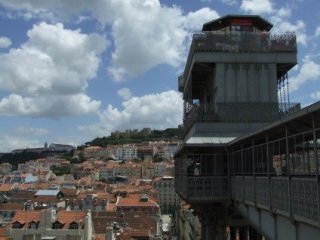 Once there we can enjoy a beautiful view of the Baixa and its squares, the castle of São Jorge and the river. . 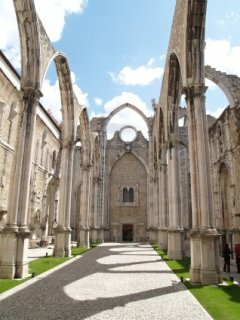 Going out of the elevator we face with the Carmo convent: Gothic ruins without roof. It is a must. After visiting the convent we can go on down to the Armazens Chiado through the Calçada do Sacramento. You can walk from Chiado to Baixa through this Shopping Centre of Chiado. You can go to Chiado by subway, too. This station has got two exits: one to the Baixa and other, higher, to the Largo do Chiado. If we take the Chiado way we will find the Pessoa's statue at Rua Garret and the Camões Square. One way of going to Bairro Alto is taking the elevators: one is called of Bica and other is called of Glory. This one starts at Restauradores and take you next to the Miradouro (viewpoint) of São Pedro de Alcántara. Bairro Alto is the centre of nightlife and eating out, there are a lot of shops, pubs, etc. Its streets are narrow,dark and really steep. This building's roof was destroyed by the 1755 earthquake. The Gothic archs and the columns are still standing up, and these ribs are one of the city's landmark. Curiosly, there were not many tourists visiting the ruins, and the ticket was cheap. Inside the convent there is a little museum where you can find sarcophagus and some copies of antiques things; there is also an Egiptian mummy and a pair of Peruvians children mummies; In the chapel there is a shop to buy souvenirs.